You create a design by your own self; you own the right to reproduce it. You alone that is. For personal purposes. Commercial profits. Not-for-profit work. It’s yours to use in any way you deem necessary. And others will have to pay if they want to use your design. Sounds simple so far doesn’t it? But there’s more. The design that you create, that means the fonts, the techniques, the lines and shapes – all these elements need to be yours. Your creativity. Your thang. Your masterpiece. So far, so good. Now let’s turn to what a copyright means to a small business that employs your services as a logo designer. Now suppose there’s this small business that employs you to create a nifty logo and brand identity for them. In such a ‘work-for-hire’ case scenario, the copyrights of a logo design transfer to the small business instead of the logo designer. After all, they paid you for the exact purpose. Which means that your creative labor is owned by them. Their thang. Their brand. Their masterpiece as designed by you. But there is a catch her for companies. Granted that the companies now own the design that you created, but they only own that part of it. They can use it anywhere they damn well please. But here’s the thing. You, the designer can still claim that the design is yours as a reference. You can cite it as part of your portfolio but that’s just it. Businesses need to know this part beforehand unless you want to get into a whole mess of miscommunication down the road. But copyright issues abound under certain circumstances, blurring the lines between what copyrights may mean to the designer or to the SMB. Lets tackle some of the common copyrights issues that designers and SMBs alike are run into. There are some rather important issues of copyrights that both the SMBs and logo designers need to be aware of today. Let’s take the example of fonts here. Especially those that are commercial and designed by other artists, who want to be paid for anyone using it. It also means that you can’t use another designer’s typeface (font) unless you have paid the license fee for it. And here’s the kicker. You can use it for your personal use. Not for commercial projects. Like designing a logo for another corporate concern with that font. That is, unless the user agreement allows for that. Ok fine. One designer can’t use other’s painstakingly developed typeface. Or logo design. Or any other duplicate element that another designer actually has the bragging rights for (we mean the license, but you already knew that). Now, having heard all that business about fonts, allow me to let you in on a secret. You can still use that font for commercial purposes. Its legally allowed. If you fulfill a host of painstaking conditions that is. Here’s how you do it. You print out the font glyphs at very large size, scanning those printouts and importing it into a font design application, you can trace out those images manually and make it part of your logo. That’s it. And it’s within the confines of the US copyright law too. It may not seem like a morally right thing for a designer to do, but if a business insists on using the design, then this is the means to employ. 2. How Original is Original? So the copyright laws allow for you to own your creations so long as they are ‘original.’ But really, as anyone would tell you, who can tell what’s original these days in the era of digital media? Proving that something is your own original creation is a lot harder than coming up with something wholly original. So when in doubt, trust your designing guts. Make sure you run a check of your design on the internet, spotting any similarities or otherwise as they appear. Let’s define what constitutes copyright infringement first. You make something. This something is put out for public observation. And then some two-bit designer comes out of nowhere, steals portions of your design without your say so and profits from the same. 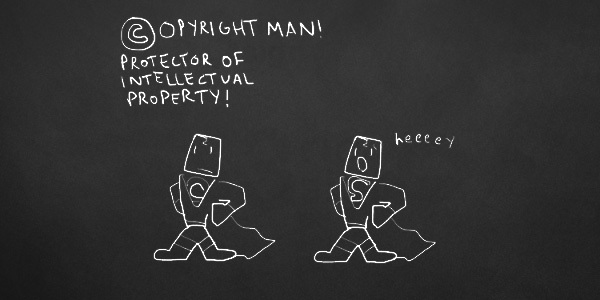 Poking fun at copyright laws. This is the simplest definition of copyright infringement. Yet what constitutes design theft varies from nation to nation. This is something where it pays for a designer to do due diligence in their work process. Keeping copies of your working files and that too with dates proper. Witnesses who have seen you working on it. These factors can prove instrumental in making your case strong. Or if possible, you can get your work registered, a sure fire way to prove any pretenders wrong. A small company might not take intellectual property rights seriously for paucity of funds or general lack of interest, but it is still incumbent on the designer to do the bare minimum that they can to protect their work. Michael Jordan of the Chicago Bulls was one of the most visible brand ambassadors for Nike. It stands to reason that Nike could’ve used his likeness in a logo design. This is exactly what Nike did with its Jumpman logo. Except there was one problem with that. The silhouette that Nike employed in its logo design was a photograph snapped by Jacobus Rentmeester of a college-age Michael Jordan. Nike originally approached Rentmeester to use the 35mm transparency of the slamdunk-taking Jordan, for limited use in marketing for $150. Nike liked the image and continued to use it in the months ahead, paying $500 for making use of the image for the time. One year later, Nike would go on to reshoot the Jordan jump photo and use it for the Jumpman logo. Rentmeester went to court and sued Nike. The court favored Rentmeester’s version and awarded him victory. As part of the settlement, Rentmeester was paid $15,000 and Nike was given a two year license to use the image they reshot. Gucci, the Italian fashion giant, sued Guess, an American mall brand for a host of copyright violations. One of these copyright infringement violations were attributed to logo design. More specifically, it was Gucci’s contention that the G in Guess was a blatant rip-off of the Gucci script logo. The courts in Italy, America and France didn’t maintain the petition that was brought over by Gucci and they observed that nothing about the case warranted counterfeiting, unfair competition or copyright violation. Instead, Gucci was made to pay damages to Guess. The case has been appealed, but if the previous court rulings in different countries are anything to go by, there’s not much of a case there for Gucci.